Johannes Brahms (7th May 1833?3rd April 1897) was a composer of the Romantic period. Born in Hamburg, Germany, he eventually settled in Vienna, Austria. Brahms wrote a number of major works for orchestra, including two serenades, four symphonies, two piano concertos, a Violin Concerto, a Double Concerto for violin and cello, and a pair of orchestral overtures, the Academic Festival Overture and the Tragic Overture. His large choral work Ein deutsches Requiem ("A German Requiem") is not a traditional, liturgical requiem (Missa pro defunctis), but a setting of texts which Brahms selected from the Lutheran Bible. The work was composed in three major periods of his life. An earlier version of the second movement was first composed in 1854, not long after Robert Schumann's attempted suicide, and was later finished and used in his first piano concerto. The majority of the Requiem was composed after his mother's death in 1865. The fifth movement was later added after the official premiere in 1868. The complete work was then published in 1869. Brahms's works in variation form include the Variations and Fugue on a Theme by Handel and the Paganini Variations, both for solo piano, and the Variations on a Theme by Joseph Haydn in versions for two pianos and for orchestra. The final movement of the Fourth Symphony (Op. 98) is also formally a set of variations. His chamber works include three string quartets, two string quintets and two string sextets, as well as a clarinet quintet, a clarinet trio, a horn trio, a piano quintet, three piano quartets and three piano trios. He composed several instrumental sonatas with piano, including three for violin, two for cello and two for clarinet (which were subsequently arranged for viola by the composer). His solo piano works range from his early piano sonatas and ballades to his late sets of character pieces. Brahms also wrote about 200 songs and is considered among the greatest of Lieder composers (with Schubert and Schumann). His chorale preludes for organ, which he wrote shortly before his death, have become an important part of the organist's repertoire. Brahms never wrote an opera, nor did he ever write in the characteristic late-19th-century form of the tone poem, strongly preferring to compose absolute music that does not refer to an explicit scene or narrative. 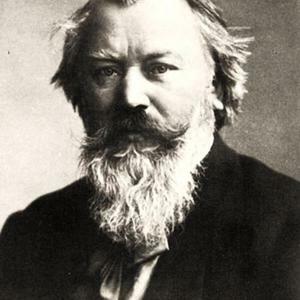 Despite his reputation as a serious composer of large, complex musical designs, some of Brahms's most widely known and commercially successful compositions during his life were aimed at the thriving contemporary market for domestic music-making, and are small-scale and popular in intention. These included his arrangements of popular dances, in Hungarian Dances, the Waltzes Op. 39 for piano duet, the Liebeslieder Waltzes for vocal quartet and piano, and some of his many songs, notably the Wiegenlied, Op. 49 No 4 (published in 1868). This last item was written (to a folk text) to celebrate the birth of a son to Brahms's friend Bertha Faber, and is universally known as Brahms' Lullaby.